UNESCO published the Global Report on Culture for Sustainable Urban Development in late 2016. Two UN events stimulated its creation: a document entitled Transforming our World: the 2030 Agenda for Sustainable Development, which emphasizes seventeen global goals for future international collaboration, was signed in September of 2015 at the Summit in New York. Habitat III, the conference held once in twenty years and dedicated to housing and sustainable urban development, took place in Ecuador in October of 2016. The question of culture’s role in urban development, and what problems it can solve, was raised at both events. To answer it, UNESCO summarized global experience and included successful cases of landscaping, cultural politics, events, and initiatives from different corners of the world in the report. It is fascinating. This article, written by Svetlana Kondratyeva and translated by Olga Baltsatu for Strelka Magazine, examines the most interesting cases of the role of culture in sustainable urban development based on the UNESCO report. South Africa features with the District Six Museum posted as a landmark of tragedy. The South African Institute of Architects works hard to ensure that sustainabilty in Architecture is a key focus in all projects.”By aligning to the South African Constitution and various Acts of the Built Environment that promote sustainable built and natural environments, our aim is to highlight architecture as a profession that is a vital contributor within the built environment,” said Vice President of the Association Kevin Bingham in an article on Bizcommunity recently. Through aligning ourselves with strong affiliations and partnerships that promote a need for a resilient and sustainable built environment, we better position ourselves, regional institutes and the members we serve, to be more socio-economically empowered. The AfriSam-SAIA Award for Sustainable Architecture + Innovation is currently open for entries. The awards are a way for SAIA to recognise contributions that bring sustainable innovation to living environments through an integrated approach to communities, planning, design, architecture, building practice, natural systems and technology. The awards were initiated in 2013 and take place every two years. “The four key criteria address harmony, social upliftment, evolution and place-making performance. While these will be the beacons of our judging criteria, I will also be reviewing economic prudence, attention to detail, and user needs,” says Bingham. The deadline for entries in the AfriSam-SAIA Award for Sustainable Architecture + Innovation is 24 March 2016. 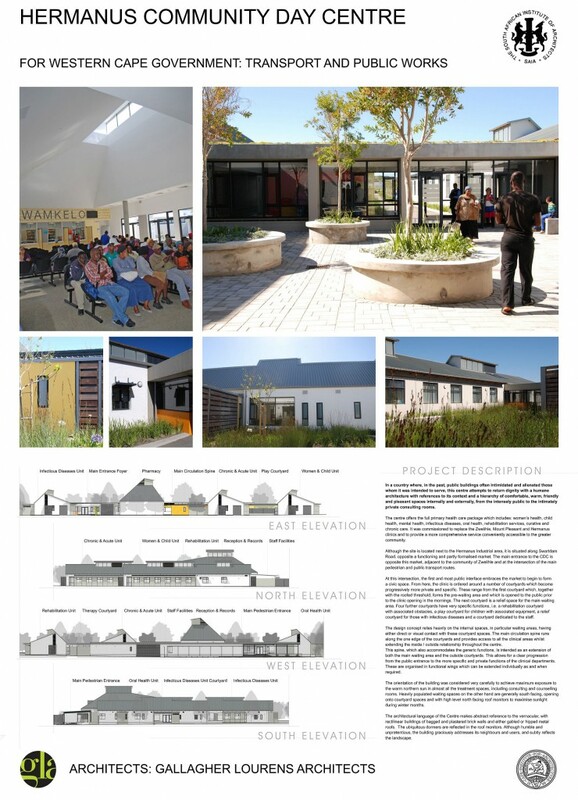 For more information, go to www.sustainabledesign.co.za. 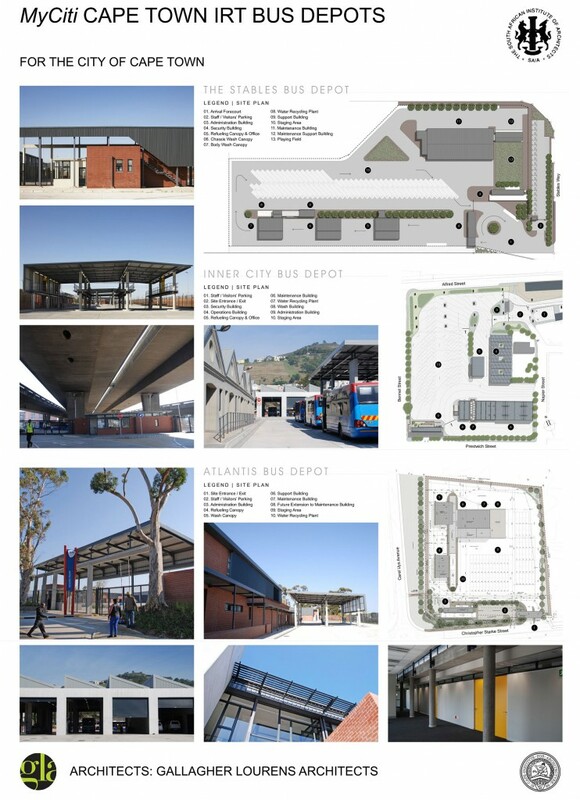 We are extremely proud to announce that, at the regional Cape Institute for Architecture Award Ceremony held on Wednesday 30 September, two of Gallagher Lourens’ projects were included amongst the twelve Merit Awards recipients. “This building acknowledges that as architects, one of our primary roles is to support people feeling at home and at ease in our busy, complex world. By anchoring itself firmly in the hubbub of the adjacent street life, with its informal trading and fine-grained housing, the threshold between where clinic begins and street stops is blurred. A wide verandah, with low walls and seating on the street gives way to a calm, white walled courtyard with plenty of place to sit in the sun, out of the wind. Only then do you enter the building, to be greeted by a beautiful view of the distant mountains, framed by low bagged and painted farm-like buildings and planted werf walls. So, it is with a sense of grounded ease that you finally reach the reception desk with your medical issue. Colour is used to clearly articulate the various services such as women’s health, child health, dental care and more. The character of the reception desk is defined by the confluence of these bright colours. 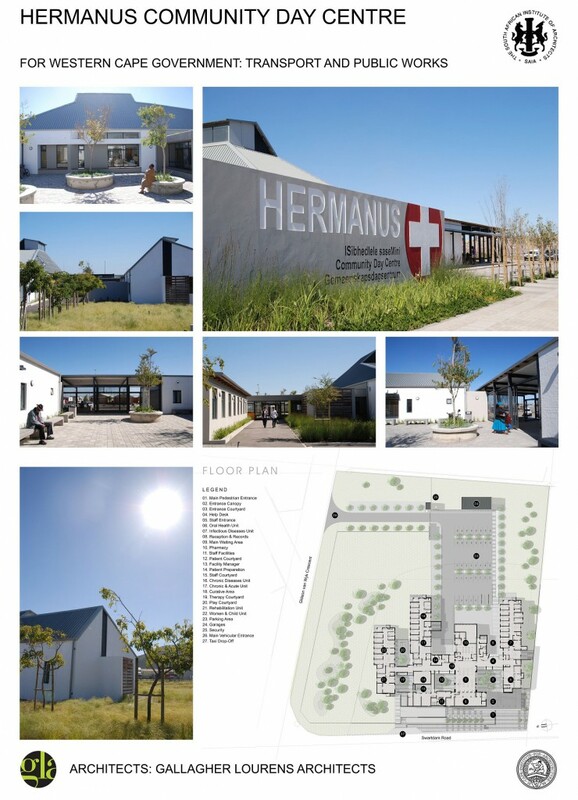 The greater community of Hermanus shares the Clinic, so it would serve a cross-section of our diverse society. That the internal circulation spine continues the theme of “streetness”, with its stone floor and low window seats, is a constant reminder of the common, shared nature of the facility. The main waiting area with its high ceiling tilted up to allow the north sun in, feels more like a public square than a clinic waiting room. No hushed voices and worried faces in this place. In contrast to the bubbly nature of the main waiting area, the smaller waiting rooms have an intimate, contained feel. Although tilted ceilings gathering in north sun remains the marker of these as shared place. A true architectural innovation from the team at Nice Architects in Slovakia who designed a very contemporary house, called “Ecocapsule.” This unique environmentally friendly house is compact and uses little energy. It comfortably houses two adults and has a build-in kitchenette with running water, toilet and shower. Read more about the Ecocapsule here. Hansgrohe South Africa recently launched a web-based bathroom and kitchen design tool called iSpecify. This online specification tool allows architects and interior designers to plan, source and coordinate their projects with the Axor and Hansgrohe products ranges. The tool allows designers to create 3D visualisations of their bathroom or kitchen designs using Axor or Hangrohe products and to manage their projects by incorporating useful technical data. The site has a reference section of international products for inspiration, and users can browse and select from an extensive online catalogue of Axor and Hansgrohe products. The fun comes in when you view a selection of existing bathroom and kitchen areas to find products and layouts you like. By clicking on a fixture in a design visualisation, the program immediately suggests a selection of suitable products to choose from. The programme also automatically connects the designer and its nearest Hansgrohe project consultant to allow for easy collaboration and coordination of projects. You have to register to use the full functionality of the site. But it does look like a very useful tool that will help us, as Architects, in choosing the right finishes for both commercial and residential architectural projects. 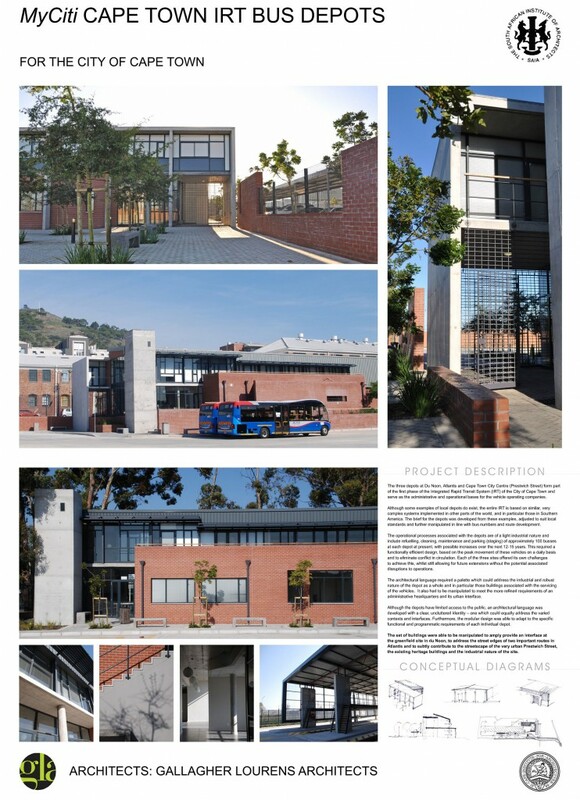 Gallagher Lourens Architects, Cape Town strive to find creative, innovative and environmental design solutions which are respectful towards the South African environment, both natural and man-made, and which do not mimic existing precedent, but rather take cues from it.